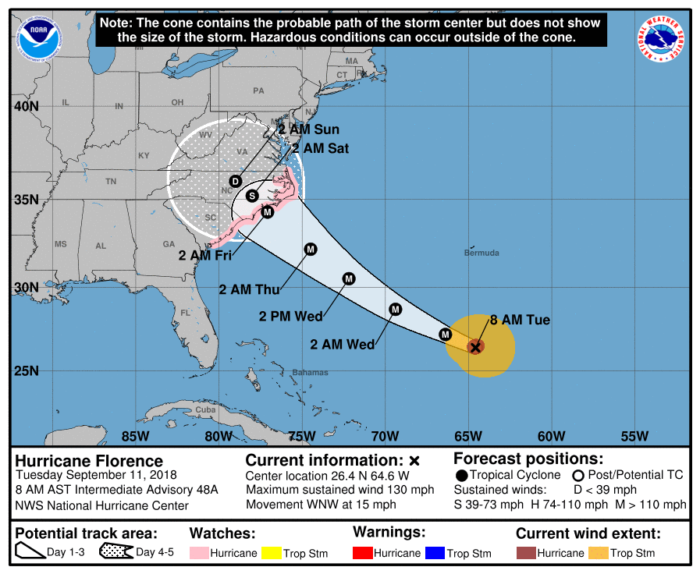 The National Hurricane Center has posted a hurricane watch for parts of the East Coast as Hurricane Florence continues to move closer to the U.S. The hurricane watch stretches from Edisto Beach, SC to the North Carolina-Virginia border. A storm surge watch is also in effect for the same areas. 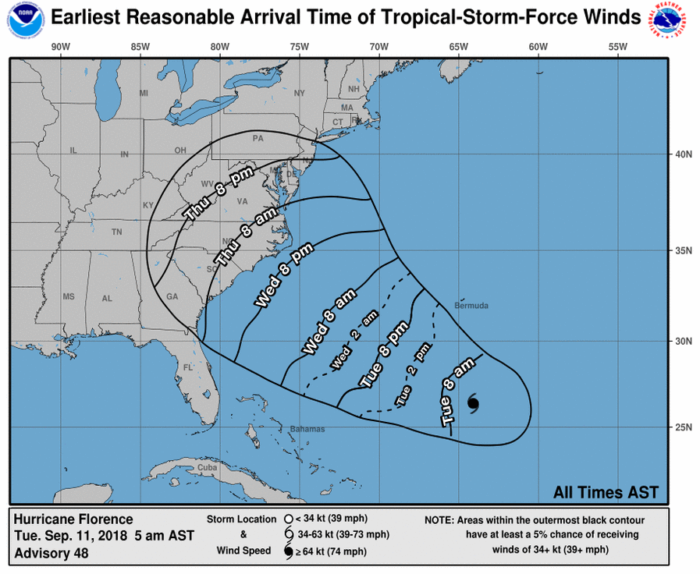 Florence is still well off the coast, sitting approximately 950 miles ESE of Cape Fear, NC. 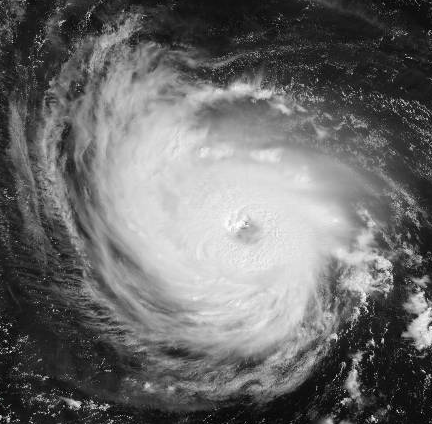 The hurricane remains a category 4 with maximum winds around 130 mph. Some strengthening is expected later today. Evacuations have been ordered in parts of Virginia, North Carolina and South Carolina. In fact, all residents living along the coast in South Carolina have been ordered to evacuate. All three states have also issued states of emergency. The threats from Florence remain the same regardless of exact intensity: dangerous, life-threatening storm surge, extreme rainfall and freshwater flooding, hurricane force winds and isolated tornadoes. Tropical storm force winds could arrive along the coast as soon as late Wednesday evening. Rainfall in some spots could top 20″. If you live along the East Coast, now is the time to prepare. If you live an evacuation zone, follow all directions from local officials. If you live outside of evacuation zones, make sure you are prepared for the potential of no power or water for several days and maybe even up to a week. At this time, models suggest landfall somewhere along the North Carolina coast early Friday. It is important to remember that regardless of exact landfall location, dangerous conditions can be expected from South Carolina to Virginia.